With only one month to go until Christmas I’m getting into the spirit of the season and starting to decorate my home with all the magical touches that Christmas brings. It’s such an exciting time of year and I always finding myself counting down from early November debating how early I can get away with putting my decorations up! Adairs has launched their stunning range of Christmas products and it’s simply beautiful. For years I’ve had my eye on a beautiful small wooden birch style branch Christmas tree and I have finally found the perfect one at Adairs (available in 3 sizes here). I love this tree, it has such a special feel; like something out of a magical enchanted wonderland. The appeal for a gorgeous tree that requires zero maintenance is pretty hard to go past with a busy family so this tree is just perfect! Adairs have a large selection of the MOST beautiful ornaments to fill the tree – I found it really hard to choose! My favourite pieces are the clear baubles filled with little woodland creatures and glitter (here) as well as the ceramic stars and shapes in the prettiest pastel colours. This has given my tree a really contemporary touch which I love and different to the traditional red and green (shop here). I also fell head over heels in love with these little green Christmas trees, which I currently have sitting on a shelf next to my fireplace but plan on using them as a centerpiece on my Christmas table on Christmas day (white trees here). My kids also fell in love with this gorgeous polar bear snow globe (here) with snow inside – this is such a cute piece for a shelf I just love it! While I was in Adairs I found the best Santa sacks for the kids! They went crazy when I put these under the tree. 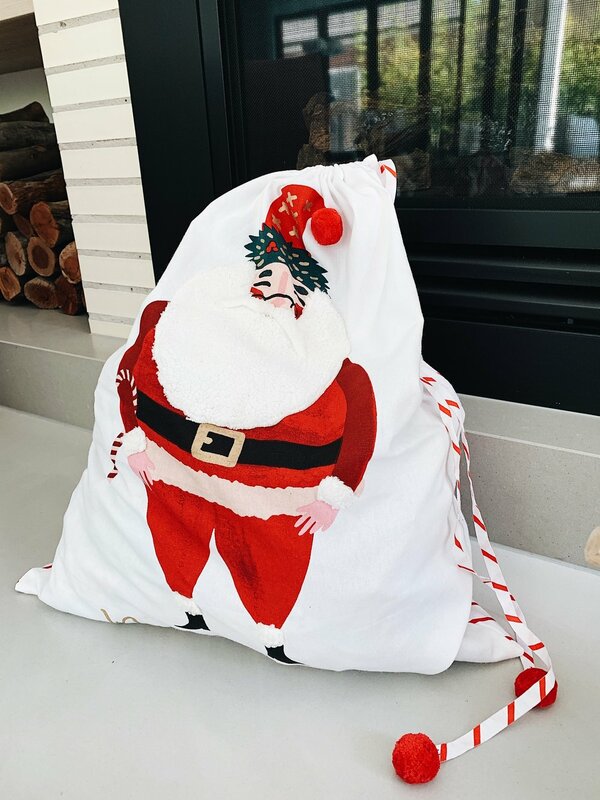 With a hand stitched feel and wooly beards on Santa, these sacks are huge so will fit all their Christmas gifts really well (shop here). Adairs is really a one stop shop this Christmas with gorgeous wrapping, ribbons, gift tags (here) and all the trimmings as well as great presents for kids. Make sure you pop into your nearest store or shop online and get your home ready for the festive season with Adairs.